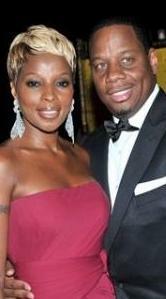 *Both the New York Daily News and the New York Post have reported that Mary J. Blige hauled off and socked her husband Kendu Isaacs in front of guests at her album release party Tuesday night after accusing him of flirting with a woman. The reported punch in the face – which drew blood, according to the Post – went down at New York’s M2 after Blige allegedly saw Kendu checking out one of the waitresses. Isaacs, according to the Post, was tossed out of the venue, while Blige went to the ladies room to fix her hair and makeup. But she bounced soon after, leaving partygoers Jay-Z, Beyoncé, Busta Rhymes and others behind, according to the papers. When asked to confirm the reports, Blige’s rep, Karynne Tencer, told the Post, “People lie and don’t know what they’re talking about.” When the Daily News asked for a comment, she referred to the incident as a “misunderstanding” and said Blige’s marriage is as strong as ever. Well in that case we truly want to wish the couple a very Merry Christmas and a HAPPY New Year. The “misunderstanding” was you’ze shoulda duckeded.